Hand painted square bottle with cork stopper. 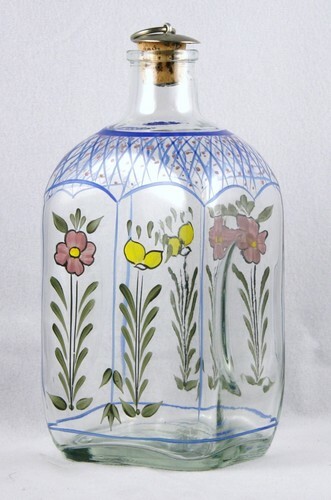 The bottle was made in Portugal and may have originally held olive oil. It's stopper is attached to a metal cap with a ring for pulling it open. It measures about 3 inches by 3 1/2 inches by 7 1/2 inches high. Excellent condition with no chips, dings or mars.